Now that the United States Ryder Cup golf team has lost the cup once again questions abound as to why this group of talented golfers doesn’t seem to be able to win a team competition against a patch-work team of players from Europe and Great Britain. Phil Mickelson has again put his foot in his mouth and made disparaging remarks about the team captain, Tom Watson, who (it is generally agreed) botched the job. Mickelson simply said what the others wanted to say but had the good taste to keep it to themselves: Watson just wasn’t up to the task. He did a couple of things right, such as putting two first-time players together who made an excellent team — only to leave them out of competition on the second day when their twosome might have won a much-needed point for the U.S of A. Also, he forgot to mention to them that they weren’t going to play. It seems Watson was too autocratic, too “stand-offish” and uncommunicative. He didn’t involve the players themselves in the decisions he made, and several of those decisions raised eyebrows around the golfing world — like the one mentioned above and the decision not to play Mickelson and his partner Keegan Bradley on the second day when they have shown themselves to be one of the most successful teams the Americans have ever put together. In any event, the golfing world is resounding with the second-guessing of experts and want-to-be experts and they all seem to agree that Watson simply did not get it done. This raises an interesting question: why is it that outstanding players like Tom Watson so often make terrible coaches in sports of all types? Bill Russell springs to mind — one of the greatest basketball players ever to play but a mediocre coach, at best. The European Ryder Cup team was captained by a very good, but not outstanding, golfer by the name of Paul McGinley who seems to have had the magic touch, taking the same types of self-absorbed, wealthy, spoiled golfers from Europe and melding them into a winning team. Again, why does this sort of thing happen? My guess is that the outstanding athletes don’t know what it is that makes them outstanding at their sport. They play largely by instinct. I once watched Marty Riessen give a tennis lesson to a middle-aged woman on the tennis courts at Northwestern University. Riessen was a perennial Big Ten tennis champion, played on the Davis Cup team, and later turned professional — once beating Rod Laver for one of his professional championships. But as a teacher he was tongue-tied. He had no idea what to say to his pupil. He became increasingly frustrated and she got correspondingly tense as the lesson went down hill. This is an extreme case, but it is graphic evidence of the inability of at least this great player to communicate to someone else what it is they needed to do to be successful — like the brilliant physicist who can’t teach entry-level physics. And that seems to be the key: communication skills. Anyone who listens to Tom Watson will be immediately struck by the fact that he has difficulty saying what he is thinking. Couple that with his determination to stand away from his players and call the shots from on high and you have a formula for failure. A good coach is frequently one who has struggled himself or herself to learn the basic skills of the game and who has the ability to communicate with the student just what they must do to be successful. 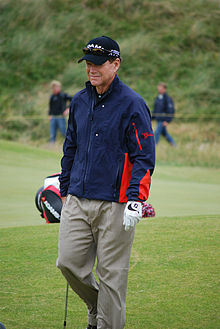 I dare say that golf came very easily to Tom Watson. And he apparently can’t pick up on the chemistry that does or does not exist between people. I was not an outstanding tennis player. I played a good deal of competitive tennis and won a number of small tournaments, but I wasn’t in a class with folks like Marty Riessen, to be sure. But in taking the game apart and putting it together again at a boys’ camp in Maine years ago with a friend of mine, I learned what it took to produce tennis strokes and was able to explain the mechanics of the game to people trying to learn it. I spent 35 years teaching tennis and another fifteen years coaching at the collegiate level. Whatever success I had was due to my own struggles with the game coupled with my sympathy for those who found the game to be difficult — and my ability to communicate with them successfully. I also learned quickly the delicate art of keeping quiet when necessary. I have seen that formula repeated again and again. The formula the U.S.A. has for picking captains is doomed to failure: a famous player who has himself achieved greatness in the sport. It works on occasion, as it did with one of the few successful American Ryder Cup captains, Paul Azinger (not himself a player in the class of Watson, but an outstanding payer none the less), but not as a rule. The Paul McGinleys of the world will usually trump the Tom Watsons when it comes to coaching — even if they couldn’t beat them head-to-head on the golf course. Not long ago I made passing reference to the apparent fact that a great many athletes who make millions of dollars playing a game and getting endorsements seem to lack any sort of social conscience. I realize that there are notable exceptions — such as Billie Jean King, Magic Johnson, Kevin Garnett, and Adrian Peterson — to name a few. But on the whole, many athletes are reluctant to speak out about the problems around them and to lend their considerable weight, money, and reputation to movements that might actually help rectify many social ills — such as poverty and the lack of opportunity for so many people. The medieval thinkers would have called this the “sin of omission,” the failure to act when an evil is clearly perceived. The problem is that many of these athletes simply don’t perceive the ills that surround them in this society. Indeed, when many athletes retire the best they can think of is to open an academy or a school where they will teach youngsters to play the games that made them famous. I blogged about Andy Roddick not long ago in this respect. That is not a bad thing and it is nice to see these people “giving back” to the games they play, but they are after all just games. There are more serious problems that need attention, to be sure. This simply shows us how small the world the world is in which these people live. But when you think about it, what are we to expect? Take golf, for example. Sports Illustrated does a poll every year among the American male golfers, and except for David Duval (who has recently been relegated to golf’s minor leagues), there isn’t a single American golfer who would be caught dead voting for a Democrat. This is not to say that only Democrats are socially responsible; that is surely not the case. But so many of those golfers are simply concerned to make sure they keep a tight grip on as much of their money as they possibly can, and they seem convinced that the best way to assure that is to vote for Republicans. If they do get involved with charities it is usually ones that touch them in a close, personal way. God forbid the state or country should take some of their money and do some real good with it. These men tend to identify the Democratic Party with Socialism and while they have no idea what that means, they know they don’t want to have anything to do with it. But again, what are we to expect? They fly all over the world, but they have no idea what is going on in that world. They live in gated communities; fly in private jets or first class accommodations; stay in high-priced hotels or rent a condominium during their current tournament; play at the world’s poshest golf courses and are taxied back and forth in the latest expensive SUV; and they engage in conversation only with like-minded, wealthy Republicans. They are the pawns of their corporate sponsors — as suggested by their clothing which is covered with corporate logos. In fact, the only people with more logos on their clothing are the Nascar drivers and they aren’t really athletes, as George Carlin reminded us years ago: they are rednecks driving around in circles. But, while we can only regret that socially aware athletes like Arthur Ashe are no longer around, when all is said and done we really should be thankful for the handful of wealthy athletes who do give some of their money and time to deserving causes — such as children’s hospitals and hurricane relief, for example. It’s remarkable that they rise above the level of awareness that seems to be the norm in the sports world where narcissistic men and women are chasing their dream in the form of a palatial home, expensive cars, and safe investments. But as they would be the first to tell me: it’s their money. Who am I to say what they should do with it? People are dying in that part of the world, but it isn’t us and therefore we really don’t care. And those deaths can almost certainly be connected to global warming. So many people in our part of the world, including many of those in Congress, go about their business denying the obvious and embracing fossil fuels as the solution to all of our energy problems and will continue to do so until the drought that is also affecting large portions of this country starts to drive the food prices upwards and makes some foods unavailable to us. When it is about us we will pay attention. We thus have a complex moral issue here. To begin with there is the convenient attitude that ignores the plight of those in need until someone close to us suddenly becomes one of those in need. Closely related is the moral failure to make ourselves aware of human suffering that requires our attention. Jean Paul Sartre insisted that we are defined by our freedom and said freedom implies a responsibility for everything that happens anywhere on the planet. If we are not aware of a problem, we have a responsibility to find out. While this may seem a bit extreme, he makes an interesting point. We are clearly caught up in love of self and the determination to deal only with those problems that affect us directly, forgetting that we are part of a human community and as such have obligations to all who suffer, which requires — at the very least — that we not ignore the plight of others. The moral imperative that seems to weaken as time rolls on is the one that directs us to take action to prevent evil whenever and wherever we see it and also demands that we take notice even when it doesn’t happen to affect us directly. Awareness of a problem coupled with the ability to address the problem implies a responsibility to act. It all begins by opening our eyes to what is going on around us. Our active concern shouldn’t have to wait until the problem is in our back yard. There is a part of me that gets very angry when I read and hear about the failings of my fellow human beings, their tendency toward self-absorption and lack of concern about the world around them or about other people. But every now and again I tumble across random acts of human kindness and genuine love and I take heart. I have mentioned Phil Mickelson who shares some of his immense wealth with others less fortunate than himself. That is certainly admirable. I am also aware that Magic Johnson has been tireless in his efforts to help the people in the inner city in Los Angles. He is certainly one of my heroes, especially when we read about so many professional athletes who spend their money on more cars, larger homes, piercings and tattoos, and so often seem to be violent and abusive. I recall with special fondness the sight on TV of a man reaching up in the stands to catch a foul ball at a baseball game. His 4 or 5-year-old daughter is sitting next to him and after he catches the ball he hands it to his daughter — who promptly tosses the ball back on to the field! Rather than toss the little girl onto the field after the ball in anger and frustration, as one might expect, the man reaches down and embraces the little girl, who seems so pleased with herself, and gives her a big kiss. A lovely moment indeed, and shown repeatedly on ESPN for several weeks thereafter — as it should be. But I have friends, we all do, who take time out of their lives to give to others, to volunteer in soup kitchens, or the hospital, or even at the golf course. It helps out, it involves sacrifice and giving of time and effort to make the lives of others more pleasant — or more endurable. I have a blog buddy, Jennifer, who takes time out of her busy life not to regale us with personal anecdotes, as so many bloggers seem to be doing, but to share news with her readers in an effort to make them more aware and get them thinking about some of the more pressing problems in our world — because she cares. I also have a close friend who has had his own terrible times and spends hours now counseling others who face the same traumas and fears he has managed to work through himself. Indeed, there are good people on this planet along with those who simply don’t see beyond their own noses and who ignore others in their pursuit of pleasure and wealth. The latter group is the larger one, I am convinced. But they share this increasingly crowded planet with others who really care and who are given to acts of random kindness. I must keep reminding myself. WASHINGTON (AP) Hall of Famer and women’s tennis pioneer Billie Jean King is asking members of Congress to help the U.S. Tennis Association with community outreach efforts. King is in Washington to meet with lawmakers and further the USTA’s efforts to develop local partnerships around the country. Speaking at the National Press Club on Wednesday, the owner of 12 Grand Slam singles titles and 27 more in women’s or mixed doubles said: ”Tennis has given me my platform … to continue my lifelong quest for equal rights and opportunities for boys and girls, men and women.” King says the USTA ”is more committed than ever to make tennis more accessible,” and has built or refurbished more than 25,000 courts in public parks or schools since 2005. Now, don’t get me wrong. 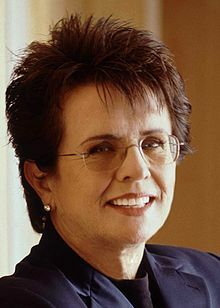 I have always been a fan of Billlie Jean King and tennis has been a big part of my life. But, seriously, doesn’t she realize that these people are supposed to have important business to conduct? Making America more tennis friendly doesn’t seem to me to be a high priority with a Congress that has a full plate — though they do seem to lack the silverware to tackle what’s on it. I readily confess I share the opinion of many of my fellow countrymen about the abilities and skills of members of Congress. Most of them seem to be small-minded, preoccupied with their own reelection, and taking advantage of their golden opportunity. Where else, for example, could you find a job where you vote yourself a raise whenever you feel the need; you make contact with corporate moguls who can get you a high-paying job as their lobbyist after you leave office; and you can pretty much waste your time and the taxpayer’s money because the taxpayers themselves are too busy trying to make a living to pay any attention whatever to what you may or may not be doing? Be that as it may, one would like to think rebuilding America’s dominance in tennis cannot be high on the to-do list, whether or not this group will ever get around to doing anything. To be sure, the story doesn’t say Billlie Jean is asking for money. It says she wants Congress to help with the U.S.T.A.’s “outreach efforts.” I dare to say that this is simply a polite way of asking for funding. In any event, if Congress were to offer the U.S.T.A. some money, I suspect they would be only too happy to take it. But let’s face it, the growth of tennis, or any other sport for that matter, is not a problem the U.S. Congress should be asked to worry about. Really, Billlie Jean, though I hate to say it, there are more important things than tennis. Billlie Jean King is on my rather short list of sports heroes, along with Phil Mickelson and Magic Johnson — folks who are keen to do the right thing, not just their own thing. But I have always thought Billlie Jean stands too close to the trees to see the forest. Like so many professional athletes, she lives in a small world, though she is admittedly an exception in taking any stand at all. She has repeatedly spoken out for tennis and for women’s rights — important issues, to be sure, especially the latter. But despite her “platform” she has also been silent throughout her life on the larger issues that affect us all, issues that take priority over even women’s rights and especially the success of this country’s tennis programs. One must applaud her for wanting to “give back” and promote worthy causes. But one must also question her perspective and lack of a sense of priorities. After all, the state of tennis in this country won’t really matter if we don’t begin to control the population, address the energy crisis, and take the necessary steps to preserve the environment in which tennis is played. Neither will the legal rights of women. I wrote a blog recently about Phil Mickelson and the admirable things he is doing with his money to help those in need. In passing, I made reference to “The First Tee,” a charity it has become fashionable for obscenely wealthy golf pros to support — in their way. To be sure, one should applaud any attempt to help others, but a charity that is designed to teach young people how to play golf seems to be nothing more nor less than an excuse to promote golf, maybe have a photo-op, and take a tax break in the process. To be sure, the “charity” also claims to teach “life lessons” and that’s when things get interesting. Consider the following description of the charity. The First Tee curriculum focuses on teaching character education and it’s “Nine Core Values” (honesty, integrity, sportsmanship, respect, confidence, responsibility, perseverance, courtesy, and judgment). The First Tee chapters use a teaching curriculum developed by experts in the field of positive youth development, and delivered by coaches. Through this experience, participants learn to transfer the values of golf to everyday life. I have no idea what an “expert in the field of positive youth development” is, but let that pass. The nine “core values” that are “delivered by coaches” are certainly worthy values. But one must wonder aloud why it falls to coaches to teach “character education” when that would appear to be the job of parents, if “character education” is what I think it is — the phrase is somewhat opaque. True, during recent years the job of teaching virtue has been shunted onto teachers and coaches because apparently the kids’ parents are too busy “making a living” to spend time raising their own children. They leave that to teachers and TV — and apparently to coaches as well. I will set aside the discussion of whether or not it is even possible for anyone except those in the immediate family to teach virtue (which Socrates insisted could not be taught at all, by the way). But the notion that it is the job of sports coaches to teach “core values” and “character” is absurd. Coaches teach athletes how to perform at a high level of skill in a sport. The “life lessons” are nothing more than affirmations of lessons the kids should have learned at home. If they haven’t been learned at home, they are certainly not going to be learned on a golf course. Let’s look at an example.